AX75. Measures 77" Length, 1/2" wide AX Cogged raw edge belt. Industrial Power Transmission Belt AX75. AX75 Molded Notch V-Belt. 77" Length, 1/2" wide AX Cogged raw edge belt. Industrial Power Transmission Belt AX-75. 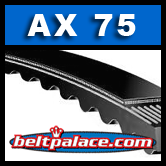 AX 75 is a suitable OEM REPLACEMENT BELT For MTD Mower deck belts. Models this belt fits: MTD Deck assembly "F" 2005-2006 with 38" decks Deck Belt, Length:77", Cogged Raw Edge. Top Width: 1/2". Cogged belts run cooler and fit around smaller pulleys. Much more economical than Manufacturer Brand parts!